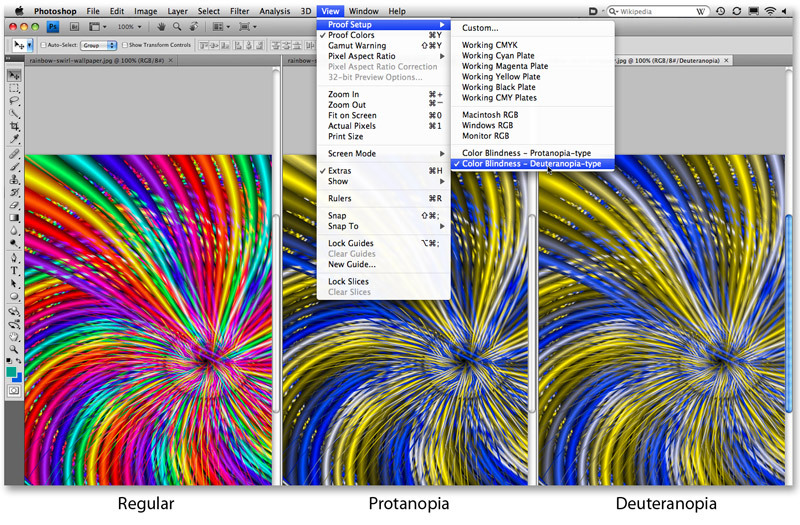 A software solution for colour blindness? This new feature is based on research conducted in Japan, called Colour Universal Design (CUD). As you can see, the two most common types of colour blindness are weakness to the red part of the spectrum (protanopia) and weakness to the green part of the spectrum (deuteranopia). By understanding these spectral weaknesses the software can adjust the colours on the screen to better match those seen by people with normal vision. I’m not exactly sure how it works, but CS4 is basically applying different colour gamuts through the colour profiles, and they in turn must be adjusting the brightness/saturation of the different colours to compensate for the loss in sensitivity to certain colours. If anybody reading this has a better understanding, please leave me a comment! With something like 10% of the male population believed to be colour blind (female colour blindness runs at about 0.5%) this could be an important breakthrough and the CUD organisation has in mind several applications from mobile phones, to ticket and ATM machines where you would tell the device/machine what type of colour blindness you have before you use it. Alternatively, you could do what I do and ask your wife (as I’m sure 10% of the married male population do)! * depending on who you ask (i.e. ‘the wife’). You need to to post that screenshot in colour. I can’t tell if I’m colour blind or not using the black and white one you posted. I am serious. I asked your mother and Tereza who also see no greens. The only colours seen in the deuteronopia is yellows, blues and grays. Well, the “regular” image looks fine to me and the other images look yellow, blue and gray. I’ve spoken to other people at work about it and if Ant can see green in the right hand image then that suggests that this is because he is colour blind. Isn’t that the point of the research referenced research? …I am afraid Dad is right!!! No greens in there! I will have to test Alexi as he has been diagnosed with bordering to severe colour blindness…maybe you should also be re-tested??!! Ok – you guys don’t geddit!! Only Tim does! The point is, if you have one of these forms of colour blindness, then those images on the right should appear the same as the ‘Regular’ one on the left, once again, ONLY IF YOU ARE COLOUR BLIND. I just went over this with Mila and it works! It’s actually very cool. I told her what colours I could see on the right hand image (deuteranopia) and she confirmed that they corresponded to what she saw in the Regular image. When she looked at the deuteranopia image she saw yellows, blues and greys and we did this BEFORE she read your comments. If your colour vision is OK, then the deuteranopia image will appear to have yellows, blues and greys – just as you all saw! That’s because YOU ARE NOT COLOUR BLIND and that image is not meant for you. If you are, then one of the other images should look better. The question now is, what’s up with dad?! The point here Antonio is that you do NOT just have “slight” deuteranopia (greek word meaning second sight I believe)as opposed to Protanopia which is the milder of the two types of colour blindless. I am sure you will correct me if I am wrong! Cant wait to test Alexi…I imagine he will have severe achromatopia…will let you know results. I don’t get what you mean? Let me correct you! Protanopia (first sight) is weakness to red light and Deuteranopia (second sight) is a weakness to green light. One is not a milder form of the other, they are different. Your retina has rods and cones, right? Colour blindness comes down to how sensitive the red/green/blue cones are in your retina. Now I think, for me, my green cones are less sensitive than my red and blue cones. If your blue cones are screwed then its called Tritanopia (third sight). If you don’t mind me saying this, sis – Your cones are fine! That’s why the image on the left looks ok to you, and the others don’t. Read the link to the CUD organisation that I provide in the post. Lots of info in there. So Alex and I must have similar colour blindness. Then you either have to add a new monitor to the list of things you NEED to buy, or…. I am completly colour blind and I see no colours (obviously) and it’s really affecting my science and art exams, and most females aren’t meant to be colour blind because 8% of male are colour blind and only o.o5% are colour blind and I’m one of them…..does any one know if there will ever be a cure for colour blindness?